ETC Management Division, Operation Div., East Nippon Expressway Co., Ltd.
A social experiment of waiving tolls on expressways started on June 28 as part of the pilot project. This is to make expressways basically free of charge for the purpose of reducing distribution costs and prices through active use of expressways and then stimulating a regional economy. This fiscal year, the sections equivalent to about 20 % of the expressway network all over the country is set as experimental sections to see the economic effect on the region and influence on congestion or environment. The experimental period will ends on March 31 next year. All the automobiles that run along the sections will become its target. This issue picks up East Nippon Expressway Co., Ltd. (NEXCO East), who positions this social experiment as its important topic at hand. We focus on "ETC Management Division, Operation Div. ", whose main functions are spreading ETC (Electronic Toll Collection System) and traffic safety countermeasures in using it. So far the Division has tried various countermeasures for traffic safety. In exploring more effective and newer approaches, they came up with the idea of developing a driving simulator (DS) for simulating diverse dangerous events that a driver may encounter while driving on an expressway using three-dimensional virtual reality (3D VR) technologies about three years ago. 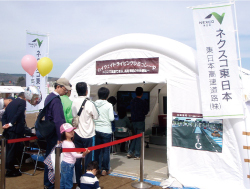 In 2009 fiscal year, this idea was realized with support of Kosokudoro-kanren-shakaikouken-kyogikai (Expressway-related Social Contribution Conference), which has its bureau in Express Highway Research Foundation of Japan (EHRF). 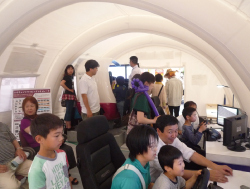 Aiming to encourage safe driving, "Highway Driving Simulator" was developed and operated in cooperation with Central Nippon Expressway (NEXCO Central) and West Nippon Expressway (NEXCO West). 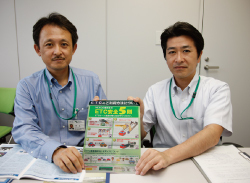 We interviewed Mr. Akira Mitsuishi, Assistant Manager, ETC Management Division, Operation Div., East Nippon Expressway Co., Ltd.; and Mr. Toru Nishimura, Section Head of the same Div, both of whom have been deeply involved from the introduction stage of the DS to its developing process and the use afterward. In 2004, four acts related with Privatization of Four Highway-related Public Corporations were enacted in 2004 through the fundamental administrative reform (decided upon by the Cabinet in 2000) and the Readjustment and Reorganization Plan of Public Corporations (decided upon by the Cabinet in 2001). Based on the Act, four highway-related public corporations (the Japan Highway Public Corporation (JHPC), the Metropolitan Expressway Public Corporation, the Hanshin Expressway Public Corporation, and the Honshu-Shikoku Bridge Authority) were abolished in 2005. Their tasks were taken over by the Japan Expressway Holding and Debt Repayment Agency and six Expressway Companies. Among them, NEXCO East took over the tasks of construction, management, and toll collection of expressways in the former JHPC along with NEXCO Central and NEXCO West. According to the website of NEXCO East, the operational length of expressways within its business area is 3,575 km, with 400 interchanges (IC) and 305 rest facilities including service areas (SA) and parking areas (PA), as of April 2010. With the headquarter in Chiyoda City in Tokyo as its core, it has four branch offices in Hokkaido, Tohoku, Kanto, and Niigata. It also has multiple administrative offices and worksite offices under each branch office. The number of employees is 2,225 in all (as of the end of March 2010). Its diverse business includes the aforementioned management and construction of expressways; providing services through the rest areas; effective use of management resources related with expressways; developing technologies for management, operation and construction of expressways and contributing to the provision of expressways in foreign countries by utilizing those technologies; and environmentally friendly projects. Operation Div. in this feature deals with the tasks related with maintenance of the already built expressways and toll collection. In this Div., ETC Management Division was established on March 1, 2007, to take responsibility of further spread of ETC as well as road safety measures associated with driving on ETC lanes. As part of such activities, the Div. organized its original safe driving method of ETC ("5 Rules of Safe ETC"). It consists of the following 5 items: (1) Insert the ETC card securely, and be careful with the expiring date! (2) Confirm the available ETC lane! (3) Take enough distance between cars! (4) Enter with the speed under 20 km/h! (5) Confirm the roadside indicator and the action of ETC bar! By advocating them along with actions in an emergency such as "What if the bar doesn't open at the entrance of the ETC lane?" or "What if you force the bar open to pass? ", they are trying to ensure the drivers' awareness about safe driving with ETC. In addition, regarding the social experiment mentioned at the beginning, they pay attention to the fact that there is difference between an ETC car and an non-ETC car as to how to pass an ETC lane though it is free of charge for both types of cars. They take care so that this will not cause a road-safety problem. From a viewpoint of emphasizing drivers' safety, NEXCO East carries out various educational activities and countermeasures. However, even if they take measures such as setting indicators and signs or a more advanced median strip, there is a limit to their effects. Mr. Akira Mitsuishi looks back that it was required to take new approaches to improving safety and reducing risks. One of those solutions was to increase the driver's own awareness, and not by conventional types of education or public relations. For instance, it was considered "if an accident has happened, one never repeats the same mistake". Nevertheless, it is impossible to have people experience an accident by using a real vehicle. Just then, someone from the Express Highway Research foundation of Japan (EHRF) advised that FORUM 8's DS could be useful for that purpose. It was about the same time when FORUM 8 sales staff provided information about our 3D VR technologies. However, the idea was left unrealized for a while. 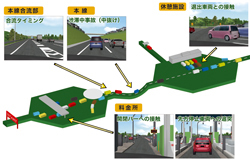 In 2009, with cooperation of Kosokudoro-kanren Shakaikouken Kyogikai (Expressway-related Social Contribution Conference) with its bureau in EHRF, they started developing DS that contributes traffic safety on expressways. Points to consider for the system was how much it could represent the expressway in realistic images. Mr. Nishimura mentions other requirements including: the hardware function that gives realistic feeling of driving, a more compact and portable system, ability to create data of the driver's behavior and their application to traffic-safety measures, and continuous update of the created VR data and system. Four companies and groups applied for the public offering in June in the same year. In August, F0RUM8, which had proposed DS based on UC-win/Road, received an order. Since then, after meeting with the people concerned from NEXCO East and Expressway-related Social Contribution Conference, we extracted dangerous events that a driver travelling on an expressway may encounter, setting them onto the DS. We repeated adjustment by having people involved confirm the ride quality and so on, and completed the whole system by the end of January 2010. Fine adjustment was continued till March 1st, the day of delivery. Also, three kinds of scenarios were prepared by combining each event to make up a course of about 3 minutes. It is so designed to educate safe driving after having the user select the course and try operating DS, and diagnosing the trial driving by analyzing its driving log. Moreover, the data of various driving actions and vehicle behaviors are accumulated for examining safe driving afterward. Safe driving method of ETC, "5 Roles of Safe ETC"
Mr. Akira Mitsuishi, Assistant Manager, ETC Management Div. Mr. Toru Nishimura, Section Head, ETC Management Div. From a viewpoint of utilizing it for traffic safety measure, it is important to have as many drivers as possible use this DS. Therefore, after delivery, DS has been kept in Nippon Expressway Research Institute Company Limited (RI). 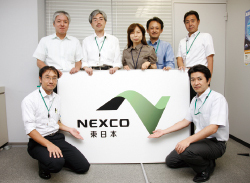 It is used at any time at the event held by NEXCO East, NEXCO Central, and NEXCO West. Starting from an event for driving DS held by NEXCO East on March 15, it has been operated in various events held by each company. At the same time, the originally established courses, 19 dangerous events, and three kinds of scenarios are to be updated and expanded with new elements to draw users' attention. 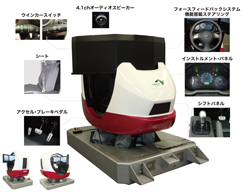 Through development of DS and its operation, Mr. Toru Nishimura actually felt its advantages of having drivers who have never passed an ETC lane or smart IC feel in their own body about what it is like, as they can experience driving with realistic images that are represented based on the data of actual expressways. However, if they try to represent brake or handling too accurately, it may cause simulator sickness. So they say that it is one of the challenges in the future how much the ride quality can be improved. He also looks forward to the potential of simulation in the field like a site of traffic accident, which is impossible to reproduce in reality. 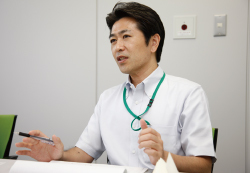 On the other hand, Mr. Akira Mitsuishi pays attention not only to the mobility of the DS but also to its function which can lead the data of driving actions of unspecified number of general drivers and vehicle behaviors into examination of traffic safety measures. In this sense, he says that now it is in the stage of collecting and accumulating these log data, and that it is necessary to work out the details for how to utilize them effectively. "The measure that we on the side of road administrators regard as effective may not be so for the drivers, who don't understand its intention. I think that such a problem can be properly judged by analyzing its log data."